Porsche is known the world over for the careful development of its automobiles out of the ashes of World War II, so it is no surprise that the ever-evolving 356 models were highly developed and sophisticated automobiles for their time. Any shortcomings in design and execution were constantly being identified, analyzed, and eliminated. 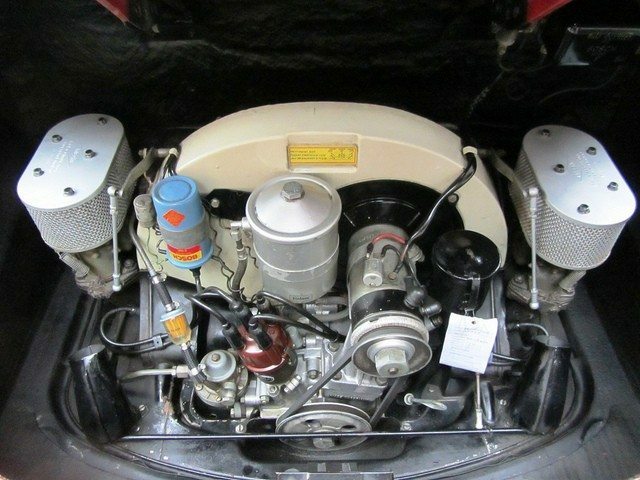 At the cars’ heart, Porsche’s horizontally-opposed “boxer” four-cylinder engine was as tough and reliable as German pride and engineering skill could make it. Rear suspension revisions, long-since refined and perfected from their Volkswagen beginnings had rendered the 356’s handling characteristics nearly ideal. Body construction and chassis dynamics came together and matured until fit, finish, and function set the standard to which other manufacturers could only attempt to match. From the start, production Porsches existed in parallel with their racing counterparts and always benefited from innovations discovered and developed there under the strain of competition. Once born, these then returned to the engineering department where they were further refined and tailored to meet, if not exceed, the expectations of their growing customer base. From early days of prototypes in Austria to full-blown production near Stuttgart, the evolution of the Porsche 356 was swift, impelled not only by Porsche’s drive for technical improvement but also by the realities of commercial success. As a result of their technical refinement and the effect of the elder Dr. Porsche’s legend had on the buying public, sales outstripped even Porsche’s most optimistic forecasts. With these increased sales also came opportunities to build more and more of the 356 in-house as well to expand the model range. Throughout its existence, the 356 underwent a thorough and systematic process of improvement, a hallmark of Porsche’s renowned engineering that continues to this day. After a decade of international appeal and successful sales, the successor to the first ten years’ generation of production automobiles was introduced in Frankfurt in late 1959. Further changes came quickly; making its debut at the Frankfurt Auto Show in September of 1959, the 356B had an updated body style with changes made to improve comfort, handling, and drivability, although available engine options remained unchanged. In 1962, 356B coupes incorporated the “T-6” body type that included twin air-intake grilles in the rear deck, an outside gas filler in the right front fender, a new cowl vent, and a flattened lower edge of the front boot lid. What’s more, the battery was repositioned and an optional gasoline heater could be nestled in this void. A new fresh air system, long-overdue, was also incorporated for occupants, providing more than just a trickle of fresh air into the cabin. Technical revisions were not scant either. By 1963, the “Super” variant benefited from an additional 20 horsepower over its standard 1,582 cc engine and was available in both coupe and cabriolet form. As engines grew in size and output, Porsche transmissions were made available in numerous gear ratios. In the American marketplace, the legendary automotive importer Max Hoffman stood at the forefront of the imported small sports car rage that swept the nation in the 1950s. Thanks largely to his singular efforts and his uncanny knowledge of the target clientele’s preferences, a small but formidable sports car company from Germany rose to prominence across the pond. 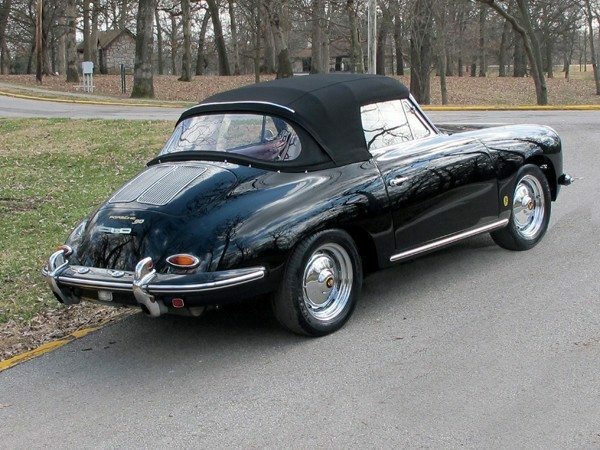 Between 1948 and 1965, more than 76,000 Porsche 356s of all engine and body configurations were produced, and a sizable number of them were exported to the vital U.S. market, without which, Porsche might not have survived and thrived in the way that it did and continues to well into the 21st century. 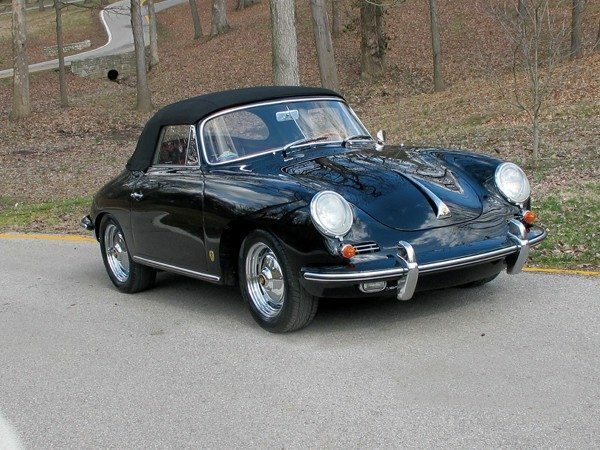 With an unflappable performance oriented sports car engine, manual transmission, a finely-tuned suspension, and appealing aesthetics inside and out, there was little not to love in the 356’s overall package. From the outset of production, all iterations of this model could be had with a convertible roof of one sort or another that went down when weather permitted. Speedster production, encouraged by Hoffman, would only last a short while, but the production of Cabriolets lasted until nearly the end of the run. Yet a Porsche with a full convertible top would not return to the marketplace for another two decades. This very-fine and freshly-restored 1963 356B Super 90 Cabriolet is without a doubt a superb example that benefits from the desirable Super 90 engine. Originally finished in ivory with black leather, during restoration, the car was changed to lustrous black with a matching top over red leather. 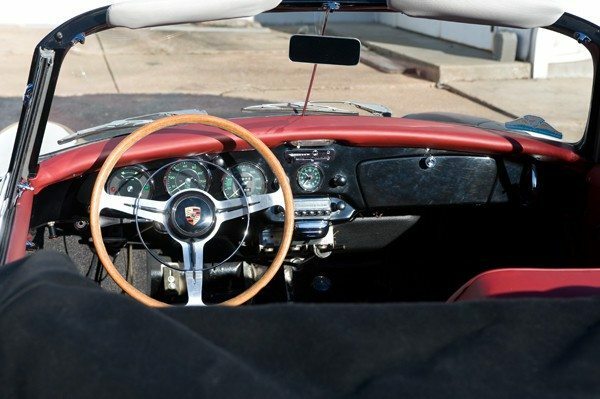 It sports a new German canvas roof that is correct to this Porsche’s vintage and the red leather, carpets, and other soft trim employed in the interior were all done to exacting quality. The spare tire, restored jack, and related tools for tire changing are all original. The car’s exterior trim is no different than the interior detailing; the chrome bumpers and polished trim were refinished and buffed to Concours standard. The 90 horsepower engine is documented as originally installed in this car by the Porsche Kardex, or Certificate of Authenticity, indicating not only the unmolested history of this car but also that it began life as a Super 90. The owner did not neglect the car’s mechanical aspects either, as less than 500 miles ago, a complete rebuild of the engine was again carried out by its current Porsche specialist mechanic owner to include new pistons, new cylinders, new bearings, and a modern, high-technology balancing of the original flywheel, un-cut standard size crankshaft, and the new clutch pressure plate. Underneath and behind the wheels, new Bilstein shock absorbers and a fully-overhauled braking system ensure that handling acuity and stopping power will keep up with the peppy engine. 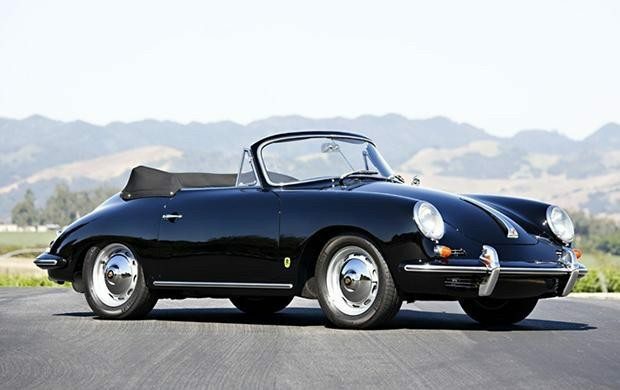 Riding on period-correct new Michelin XZX radial tires, this Super 90 Cabriolet projects a stance of originality and is a tribute to the quality Porsche imbued into each and every 356.